Which of Your Employees Have a Miserable Job? 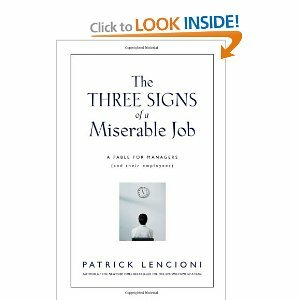 One of my favorite books, is Three Signs of a Miserable Job, by Patrick Lencioni. Have you read this book yet? Every CEO should make it required reading for their management team. Here’s my homework assignment for you: Take an excel spreadsheet, list every employee in your company, and categorize them into one of the three main categories for a miserable job that Lencioni refers to in his book. That’s the easy part, the next part is then put action plans together to overcome these miserable elements of jobs in your company. Are you to this challenge? ‘I don’t have a need to go through this with my employees. Our productivity, efficiency, and effectiveness is good enough. We don’t have to go through this time-consuming, painful process, to figure out what’s wrong with our jobs. If any of our employees don’t like their jobs, their welcome not to let the door hit them on the way out. Should Employees Be Engaged and Satisfied? I’m curious how many CEOs really believe that statement. Oh, no one raised their hands. Here’s the irony: The vast majority of CEOs don’t perceive a problem. Then why are the vast majority of your employees turned off, dissatisfied, disengaged, and are ready to look for a new job? Almost every study over the last few years indicates employee satisfaction has dropped to historical lows compared to the Great Depression. What’s the risk of having employees feel like their job is miserable? What’s the risk of having disengaged, unhappy, dissatisfied, unmotivated employees? The risk is a tolerance for “it’s not my job”, errors, customer dissatisfaction, turnover, poor performance and execution, below industry average levels of productivity, and a dysfunctional culture that permeates every element of your business. Wow – I depressed myself just making that list. When should you start to care about how your employees feel about their jobs? Should it be when you want to grow your business by $250,000 next year, or $22 million over the next 3 years? If your approach to business is “it’s good enough”, then take no action. If your approach to business is along the thoughts of Jim Collins in Good to Great, I challenge you that this could be one of the greatest areas for operational performance in your business over the next few years. What are your thoughts? What’s your experience in implementing actions to overcome the 3 primary elements of a miserable job? Q. Are there common mistakes companies make when hiring that could be easily avoided? The most common mistakes are a manifestation of the most common problems with hiring. The biggest problem with hiring is that few companies invest in training their managers on how to hire. Since many managers are not trained, mistakes abound. If more companies would train their employees on how to properly hire, most of the common mistakes would go away. A few years back we actually conducted a research project to identify the 10 biggest hiring mistakes companies make when hiring. You can download the project from our website under the Hiring Manager menu item (www.impacthiringsolutions.com). Surprisingly, when a company deals with the first mistake many of the others are positively impacted. Focusing on training your people and fixing the first mistake will have a dramatic impact on your hiring. The number one mistake companies make is that they don't properly define the job. In fact, the traditional job descriptions used by many companies are worthless for hiring and cause more harm than good. If you dissect most company's job descriptions they really define a person and not the job. For example, most job descriptions list traits of a person. We want a minimum of X years of experience, minimum education, a list of the minimum skills the person must have, then the ever expanding list of meaningless traits, team player, strong thinker, thought leader, change agent, assertive, and of course good communication skills. Granted, the minimum duties and tasks the person is expected to perform will also be listed. Does this sound familiar? If you answered, “Yes” then look closely. Not only does this define a person, but what level of person do most job descriptions define? The minimum qualified person. When you advertise for the least qualified that is what you get. Instead of defining the least qualified person, start defining success in the job and then go and find a person that can deliver that success. For example, for a customer service manager, the real job and success in the role might be to improve customer satisfaction scores from X to Y or to ensure X% of customer issues are solved on the first call. This is the real job and what defines success in the role. Now go out and find a person that can explain to you in the interview how they would go about doing this. When you find one that can do these things, they have the right experience, the right skills, the right education and the right number of years of experience or they wouldn't be able to accomplish these things. Join the other 10,000 CEOs, key executives and HR professionals and download a FREE copy of our best-selling book, “You're NOT The Person I Hired.” Just CLICK HERE and under the FREE Hiring Resources section you can download our free eBook. So often recruiters are accused of “stealing your best employee.” While it is true that we do present opportunities to your employees, the fact is, we don't steal them. To the amazement of most recruiters, the vast majority of the time the employee already has a resume prepared and ready to go. All we do is ask them if they would be open to discussing a potential career opportunity. Virtually 95% of the time the employee replies, “Yes.” Why would anyone not want to know what is going on in the market, have a discussion around their career or just get a feel for current compensation ranges? Even if they are completely happy in their current position, this is good stuff to know. What do these 10% have that the other 90% don’t? That is something a recruiter has nothing to do with. They generally have four things, 1) they are learning in their current position, 2) they feel they are having some impact on the company, 3) they are growing, and 4) they respect their boss. When these four things are part of a person's job, the best recruiter can’t get them to move. An example of this recently happened. I was jointly interviewing candidates with one of my clients. At dinner one night, my client started asking me about the job market, “Is it picking up?” and “Are any particular industries hiring?” He mentioned that he thought the market was getting better because in the last couple of months he had been contacted a couple of times by recruiters for potential opportunities. Like most, he listened to what they had to say, but in both instances he thanked the recruiter for the call and flatly turn them down. Like most, his answer had nothing to do with compensation. He commented, “I enjoy what I’m doing. I have a great boss and most of all I’m challenged.” Then he added, “When I stop being challenged it is time to move on.” In fact, prior to being promoted to his current position he was looking. If his current position had not come open he would have left the company. As he explained it, “My last boss treated me like a step child (I used step child. His word did start with an S). The position had lost its challenges, the job was the job, and that was all there was to it.” His boss was rarely around to support him and he was doing the same thing this year as he had done the last three years. Boredom and lack of respect for his boss had set in. The good news was that he worked for an excellent company. BTW, he has been with this company for 12 years and in his current position for 4 years. We realize that not every company has the ability to promote someone or move them to another position in order to retain them. However, that doesn't mean there aren't a number of things a company can do to help their best talent feel challenged, feel that they are learning, and be respected by their boss. This can happen in just about any sized company. The best recruiter couldn't “steal” this person. It all had to do with the job and the person's boss. The vast majority of people leave because they lose respect for their boss. The best selling book, First Break All The Rules, validates this. This book should be required reading for all managers, regardless of how many years they've been a manager. As recruiters for the last 30 years, my partner Barry Deutsch and I, can also validate this is clearly the number one reason candidates tell us they are open to talking about a new position. To help companies and hiring managers identify some of the things that managers can do to retain their best talent we have put together for you to download our 8 Level Retention Matrix. This matrix will help you identify whether or not your managers are doing what it takes to retain your best talent. If your managers do some, or most of these, you won't lose your talent to a recruiter. Your competition will. You can also download for free our most popular chapter on sourcing top talent from our best-selling book, You're NOT The Person I Hired. CLICK HERE to download your free chapter.